I don’t know about you, but most people get excited when they’re shopping and see freebies that go along with a product. Oftentimes, it’s a product they would not have otherwise purchased or paid any attention to. If it’s something they had planned on buying anyway, their customer satisfaction goes through the roof and they associate positive feelings with a brand. Do-It Bottle Neck Hang Tabs help you promote your brand or your partnership with another brand by attaching “free” products right to your bottle. These bottle neck hang tabs fit comfortably and securely around your product and are the perfect way to attach a promotional item to your bottle’s neck. Do-It already has hundreds of styles ready to go and there are, of course, customized options available. 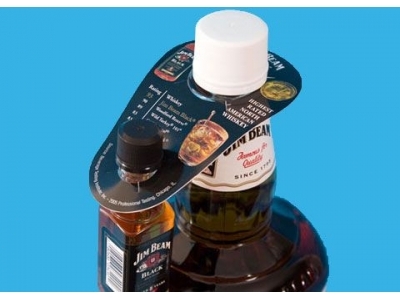 We have been a leading provider of bottle neck hang tabs for years and years on alcohol bottles, medicine, cleaning products, hair spray, lotions, perfumes or colognes, and much more. There is no more sure fire way to draw attention to your product and brand than offering your customers something for free. At Do-It Corporation, we have been the leading supplier of point of sale and retail solutions for over forty years. We attribute our success to our willingness to adapt, learn, and grow within the industry. We are always evolving and developing new and innovative products for continuously changing markets. Our commitment to quality and innovation is shown in the development of our one of a kind hang tab test center. If you have been looking for a way to effectively promote and increase sales of your bottled product, do not hesitate to contact today to learn more about how we can help you separate yourself from the competition.